WALKSTRONG ~ www.walkstrong.ca: " Maha Shivratri ... "
Today my parents and I had the opportunity to join fellow Hindus and celebrate Shivratri, an auspicious moment in reverence of Lord Shiva. Referred to as Maha Shivratri, this occurs every year on the 14th night of the new moon during the dark half of the month of Phalguna. Shivratri (Sanskrit ‘ratri’ = night) is the night when he is said to have performed the Tandava Nritya or the dance of primordial creation, preservation and destruction. The festival is observed for one day and one night only. We travelled to our local mandir and participated in the ceremonial offerings of milk, rice, sindoor, fruit and other foods all whilst our Pandit-ji narrated ancient scriptures. We chanted the sacred mantra dedicated to Lord “Om Namah Shivaya”, meaning “I bow to Shiva”. Out of interest, it has been said that if this powerful mantra vibrates continually in your heart, then you have no need to perform austerities, to meditate, or to practise yoga. To repeat this mantra you need no rituals or ceremonies, nor must you repeat it at an auspicious time or in a particular place. This mantra is free of all restrictions. It can be repeated by anyone, young or old, rich or poor and no matter what state a person is in, it will purify him. 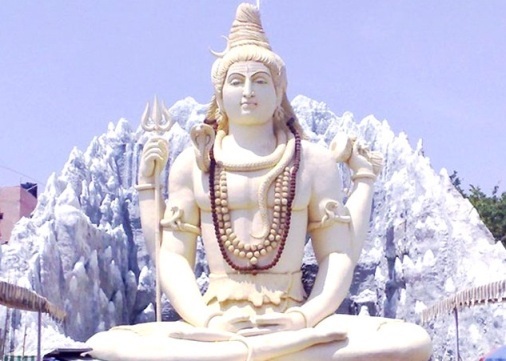 Hindus believe that the worship of Lord Shiva with devotion and sincerity absolves a devotee of past sins. The devotee reaches the abode of Lord Shanker, lives there happily and is liberated from the cycle of birth and death, attaining moksha or salvation. Yet to truly understand the origins of Shivratri, we have to look at the ancient Vedic literature. Accordingly, Shivratri comes from the great mythical churning of the ocean called Samudra Manthan, from which a pot of poison emerged. The poison was so potent that it had the power to destroy the whole Universe. The Gods and demons were terrified so when Lord Shiva was called to protect the world, he drank the deadly poison but held it in his throat instead of swallowing it. This turned his throat blue and since then he came to be known as Nilkantha, the blue-throated one. By drinking the poison, Lord Shiva sacrificed himself for the safety of humanity ... hence Shivratri celebrates this event by which Shiva saved the world.